We live in a world dominated by bacteria. The microorganisms around you are able to adapt to almost any environment and thrive – they have been found in the frozen lands of Antarctica, on top of volcanoes, in the depths of the Atlantic, and, of course, in our digestive tracts. Our civilization is but a pale comparison to the invisible world of microorganisms that surrounds us. It is not surprising that microbes have become experts of adaptation when you consider the evolutionary pressures of their world. They are constantly disrupted by changes in environment, competition from other species, attacks from specialized viruses (i.e. bacteriophages), and a shifting food supply. Imagine trying to survive in a world filled with rampant diseases, famines, hurricanes, and floods, and you’ll begin to appreciate the world of the microbe. Some microbes have colluded with the competition to form symbiotic relationships. For example, the bacterial strains Streptococcus Thermophilus and Lactobacillus Bulgaricus, work together and transform milk into tasty yogurt. The thirty or so strains of bacteria and yeast found in Kefir, a traditional fermented drink of the Caucasians, band together to form complex ecology capable of digesting almost any food source and staving off harmful pathogens. Our ancient ancestors did not live in a sterile environment. It is likely that they ingested various microbes found naturally in their foods. Some of these microbes were beneficial to their life while others caused infections and disease. Somewhere along the way in their struggle for survival, our ancestors allied themselves with certain species of microbes. Our intestines have evolved into a perfect microbial farm. We provide these microbes with furnished home and plenty of food, in return, they produce beneficial nutrients and help defend us from pathogens. About a thousand years ago, our ancestors began to experimenting with fermenting their own foods with beneficial strains to prevent spoilage, fight infections, and increase absorption of nutrients. This action further allied our bodies with the microbial world. Nobel Prize winner Dr. Elie Metchnikoff was one of the first scientists to recognize the benefits of eating fermented foods. His research in the early 1900’s focused on the Bulgarians. He believed the daily ingestion of yogurt was a major contribution to their superior health and longevity. Today, if you search the Internet on probiotics, you will find an almost endless supply of reasons why “good bacteria” are good for you. Fermenting your own foods can be a healthy, fun, and nutritious hobby. We feel that anything you can make at home is much better than commercialized foods. Fermenting your own foods is cheaper, more fun, and better for you than just popping a pill of freeze dried bacteria. If there’s anything that the microbial world does well, it is detoxifying things. Today, Bacteriologists periodically visit old military facilities in search of new strains of bacteria living off of contaminants in the soil. If you put it in the ground and give them enough time to mutate and evolve, these microbes will find a way to break it down. This probably holds true for any organic chemical. These earthly microbes purify the world. Not only have we been able to use the detoxifying properties of microbes to breakdown nasty substances, such as oil spills, military dumps, and sewer plants, we also use them to detoxify our food and water and increase shelf lives. For centuries, Europeans used wine as a source of clean, durable water. Bulgarians perfected the art of detoxifying and preserving milk (removing the lactose and predigesting the proteins) and transforming it into yogurt and cheese. The Caucasians used Kefir grains for the same purpose: detoxify milk products to make Kefir. Vegetables were also fermented to preserve them from spoilage. Most of the pickled products found on our grocery shelves were at one time a fermented product: pickles, sauerkraut, and even ketchup. However, since fermentation isn’t always a uniform process, manufacturers found another way to make these products. Competition between microbes can be fierce. The good bacteria that are normal inhabitants of our intestinal tracts will fight off many foreign intruders. They can be seen as our first line of defense in the war of infection. Scientists have documented many different substances produced by lactobacilli (lactic acid bacteria) that have been found to inhibit harmful microorganisms. For example, lactobacillus acidophilus produces several substances while fermenting milk, including acidolin, acidophillin, lactobacillan, and lactocidin. These substances have been shown to inhibit pathogenic bacteria, such as Salmonella, while leaving other lactobacilli and human cells unharmed These antibiotic agents are found in fermented milk, but not always in a probiotic pill. A study found that fermented milk products, like yogurt, can kill Helicobacter pylori (the ulcer causing bacteria) but that the beneficial bacteria alone cannot. This means that probiotics in pill form would have no effect on H. pylori but that homemade yogurt and Kefir would. Fermented products are a great source of amino acids, vitamins, and minerals. The process of fermentation increases the amounts of some vitamins. Fermented milk is a great source of energetic B vitamins while fermented vegetables are a great source of Vitamin C. Sauerkraut often served as military rations in ancient armies, most notably the Mongolians, and was used to prevent scurvy. The process of fermentation also increases the bioavailability of these foods. We have already mentioned earlier that dairy products fermented with lactobacilli have been shown to kill pathogenic bacteria, such as H. pylori, while the lactobacilli alone did not. This means that some of the antibiotic properties of these good bacteria may be missing in the probiotic pills you see on the shelves. Also, you have no way of verifying the potency or vitality of these products. Bacteria are living organisms and must be alive when you eat them in order to reap their benefits. It does no good to ingest dead, good bacteria. Furthermore, good quality probiotics are often very expensive. For instance, a month’s supply from a popular vendor may cost as much as $80 to $100 per month. With a budget of $100 per month, you can make all the sauerkraut, kefir, and yogurt you’ll need. Not only will you be getting the benefits of these beneficial bacteria, you will be making delicious and healthy meals as well. The only benefit store probiotics offer is convenience. However, once you get started, fermenting your own foods is very easy. Please do not eat spoiled fermented foods. In some rare instances, fermented foods can be overtaken by mold or become spoiled. In these cases, throw out the result and start anew. The process of fermentation is only good for you if it occurs outside of your body. 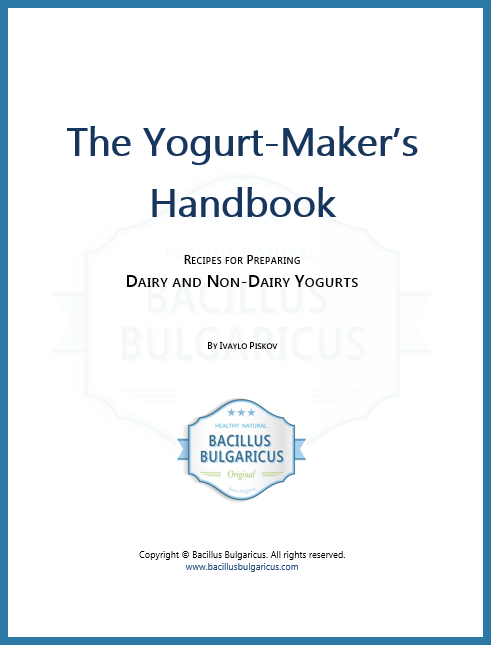 It is also believed, based on some small amount of research available, that Lactobacillus bulgaricus is one of the few Lactobacillus strains which produce histamine, so if you have any kind of histamine sensitivity you should be more cautious about choosing Lactobacillus strains and of course always consult your doctor when in doubt. In our opinion homemade products are better all around. For one, you do not have to trust a manufacturer with your health. You have total control over what you are eating. You can purchase the best milk and/or vegetables to use. Commercial products are usually geared for taste and not health. In the case of yogurt, this means that commercial yogurt usually has a high lactose content and is usually loaded with sugar. Homemade yogurt can be made to eliminate virtually all of the lactose and will be much fresher than anything you can buy in a store. If the taste isn’t to your liking, you can add in fresh fruit and/or honey to sweeten it up. Store bought Kefir has the same problems, you have no control over the lactose content in the end product. Another thing to consider is, real Bulgarian yogurt is difficult to find in the store. Quite often a manufacturer will label a product as yogurt with live culture when in fact it is not the real thing. In order for yogurt to be real, it needs to be made from yogurt culture, most often coming from dried-freeze powdered starter. As for fermented vegetables, such as sauerkraut, most commercial products have been pasteurized and do not contain live cultures. The pasteurization process not only kills the beneficial bacteria, but may also destroy many of the enzymes and nutrients. Commercial fermented foods may also contain a fair amount of unnatural preservatives. We know that you will find fermenting your own foods at home more rewarding, healthier, cheaper than probiotics, and more enjoying than anything you could purchase in the store. This entry was posted in Lactobacillus Bulgaricus and tagged Bacillus Bulgaricus, Lactobacillus Bulgaricus, Lactobacillus delbrueckii subsp. bulgaricus.